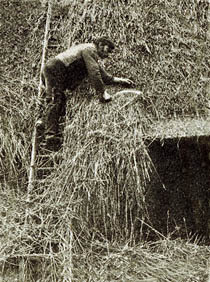 T he island and the mainland county have much in common; each area being part of the Southern tradition of thatching. 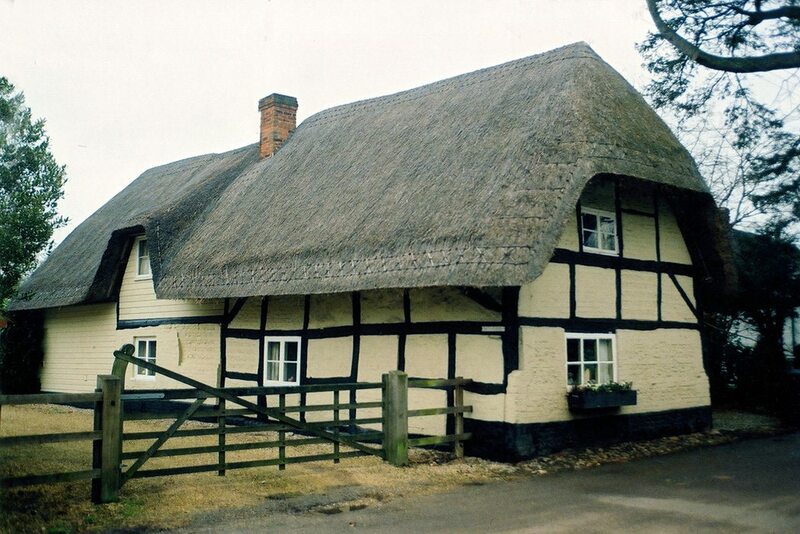 Sharing a history of multilayed, long straw roofs. 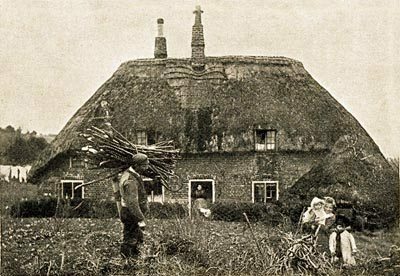 A 1965 survey, by the Rural Industries Bureau, found 68 thatchers working hereabouts; all of them working with long straw thatch and only around half familiar with other materials. 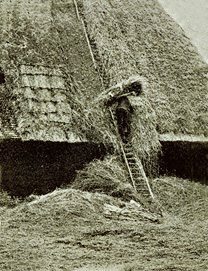 As with much of the Southern area, times have changed, long straw thatching is still to be found, but not in any great numbers. Most thatchers still keep to the old shapes, mainly using combed wheat reed. 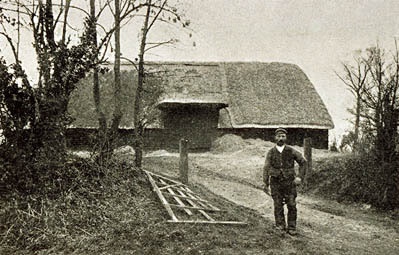 Often using liggers around the edge of their roofs, in a long straw fashion; especially when the roof is multilayered. Thatchers here have a great number of roofs to work on, this area having around seven per cent of all Britain’s thatch. 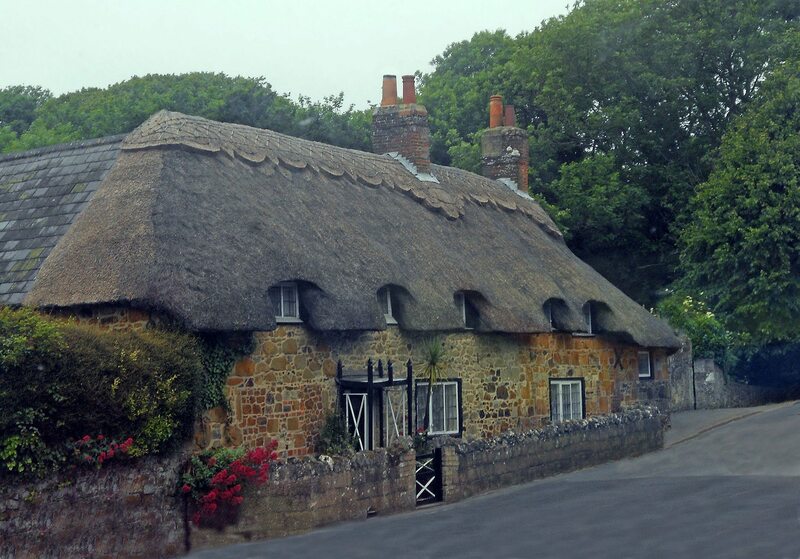 Hampshire has more rounded thatch than across the Solent; on the Isle of Wight. Here the old images show a slightly flatter, squarer shape. Perhaps just retaining a little of some past Eastern traditional influence. As with East Anglia, this island very quickly came under total English control; in the early medieval period. Other materials than straw were exploited in the past. 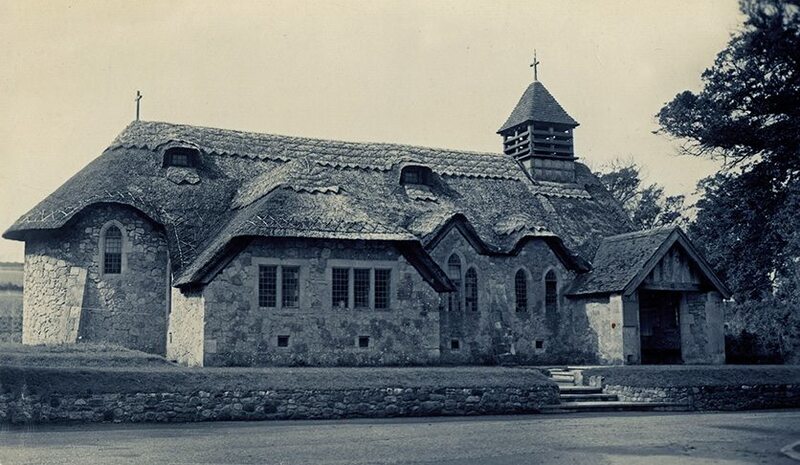 The vicar at Winslade, near Basingstoke, noted furze and sedge being used, a century ago. Sedge thatch also being recorded by the Agricultural Report of 1794, and in the New Forest, heather thatching was once widely seen. Reed beds, on the coast around the Solent, at Keyhaven and Totton were also harvested. 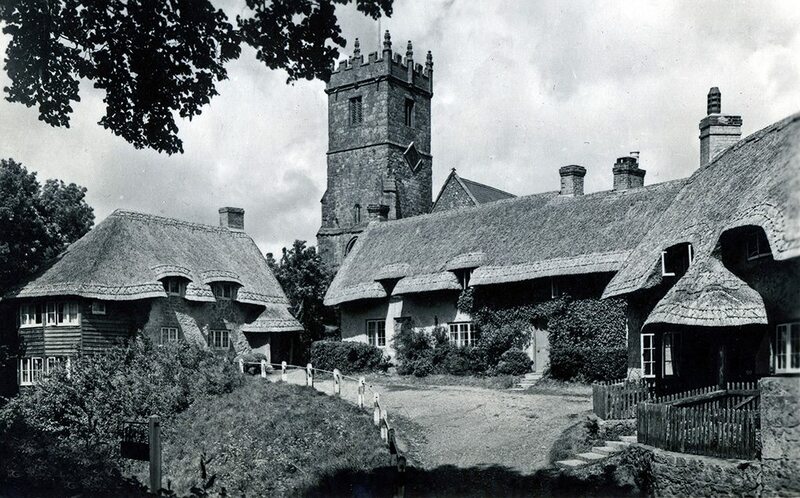 More Hampshire long straw… Still to be seen at St Mary Bourne , above; a village full of thatched houses. And a splendid building at Old Basing, below. 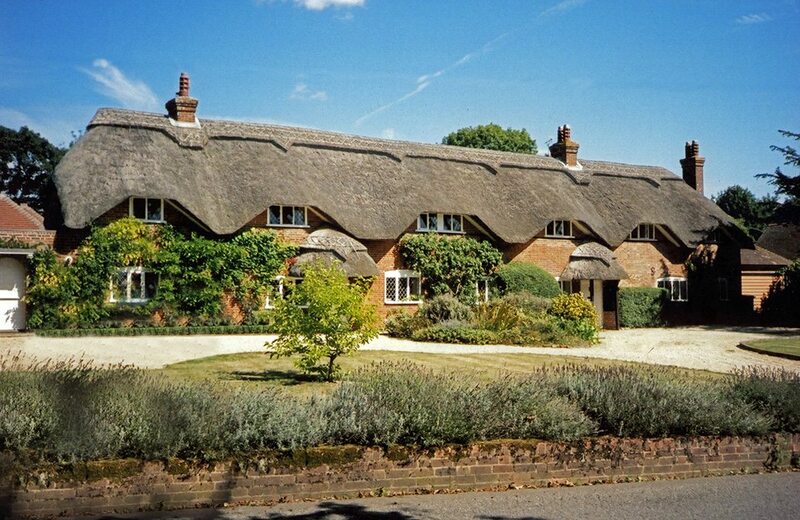 Having a grade one listing, probably ensured a purely traditional thatch, on this roof. 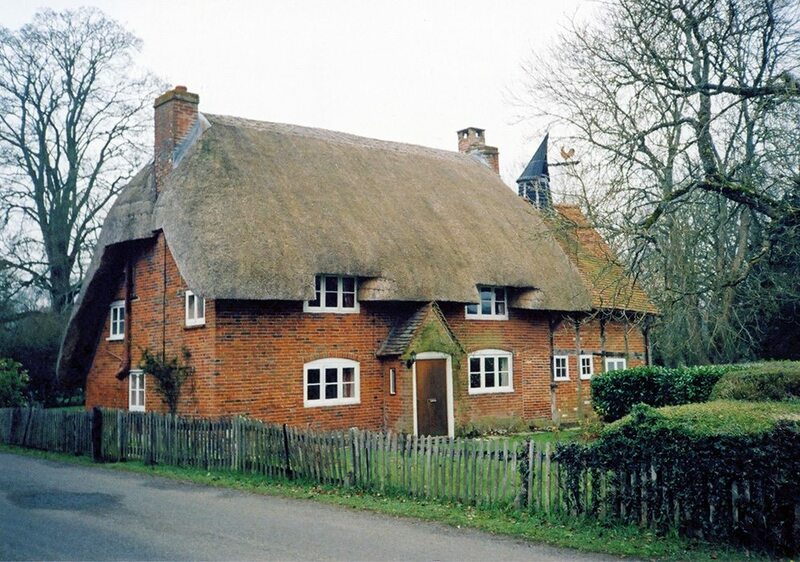 Windows… Above, a typical window finish, for Hampshire; in this old image, of a multi-layered, long straw roof, near Lymington. 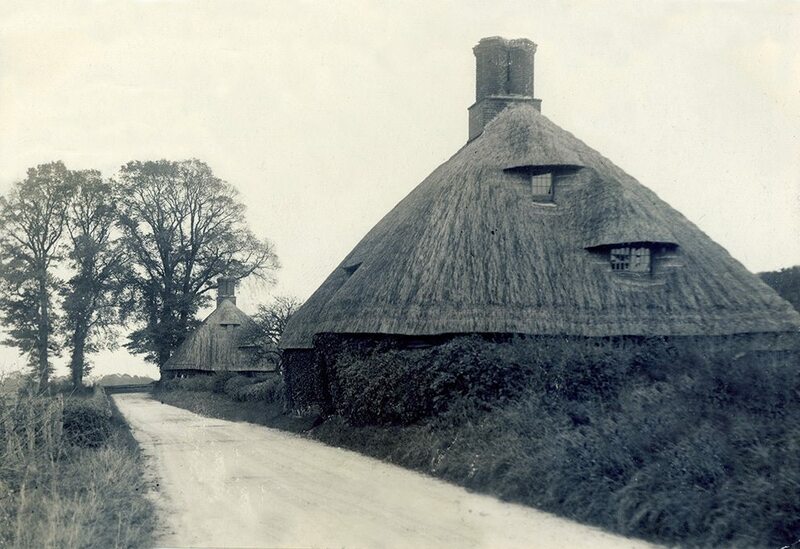 And at Broughton, on the right, a century ago. 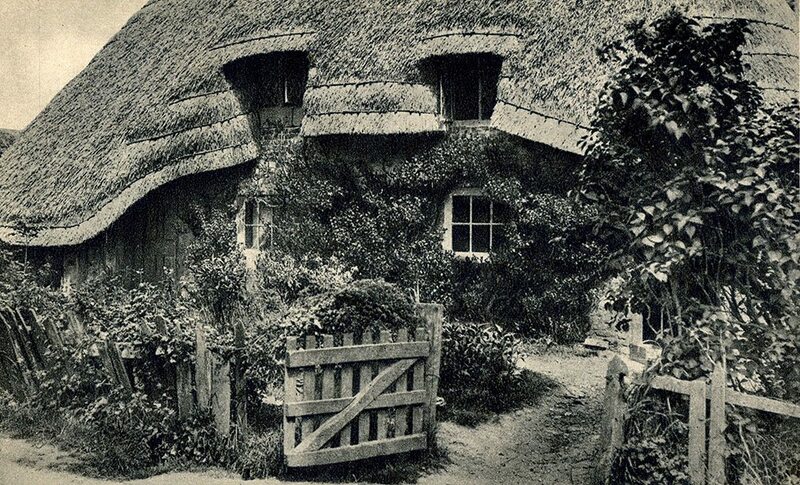 Ornate… This cottage, at Beaulieu, is still going strong, but has now succumbed to a combed wheat reed thatch. 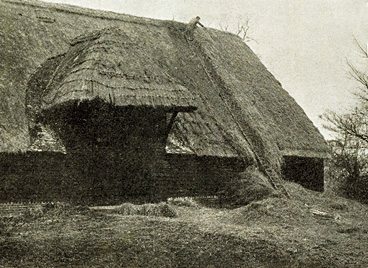 Unlike the very decorative long straw roof, it had a hundred years ago. 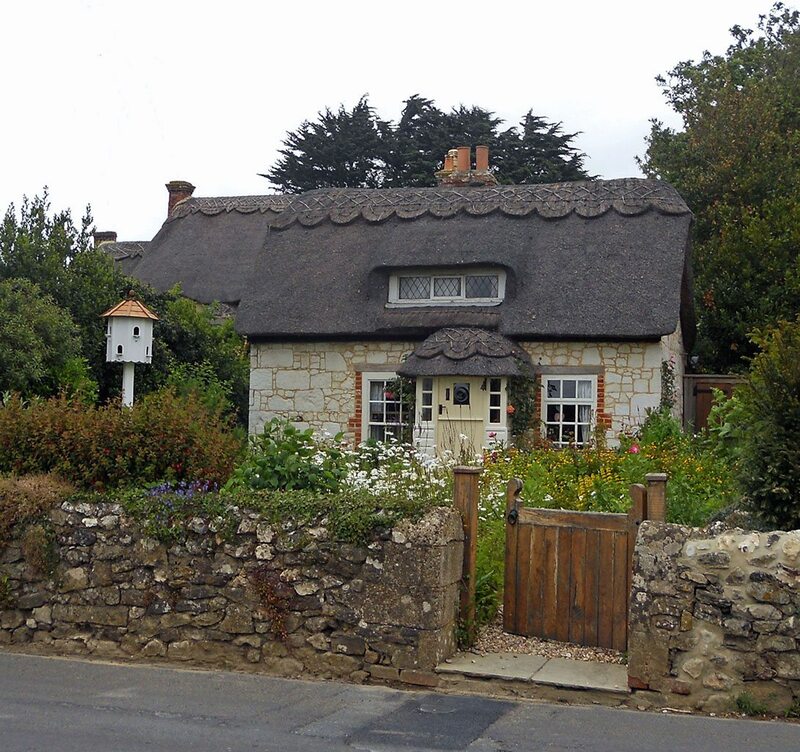 Plain & simple… The left hand cottage below, at Longparish, still retains some typical Hampshire eyebrow windows, although thatched in combed wheat reed. And has an adjoining malthouse. 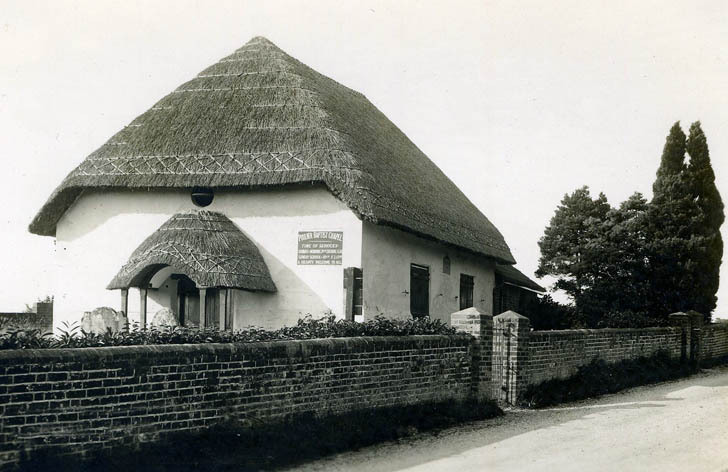 The lower right hand roof, at East Chorton, still retains a long straw thatch. Tourist thatch… On the Isle of Wight. 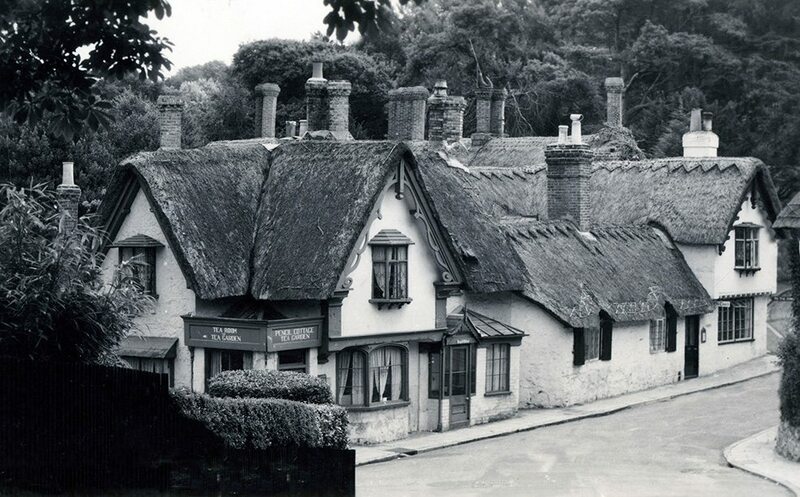 These two well known views, from the 1930’s, of Godshill, above and Shanklin below, reveal some very ornate long straw thatching. 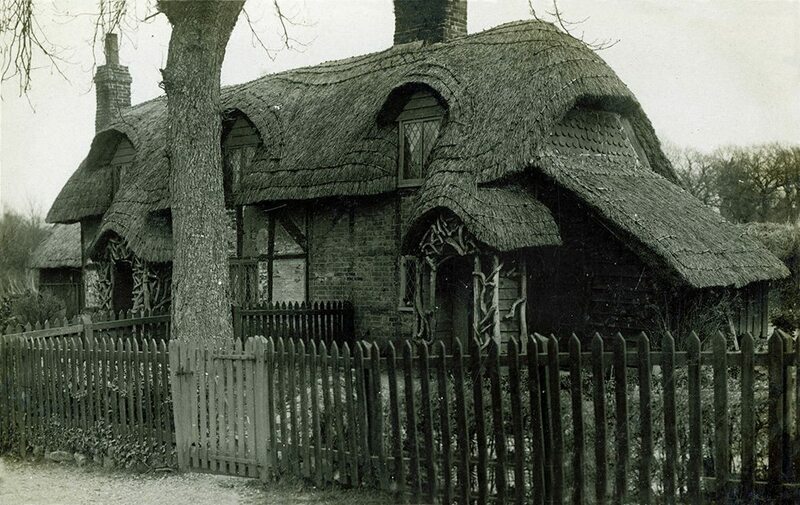 With the Shanklin view showing less rounded thatch. 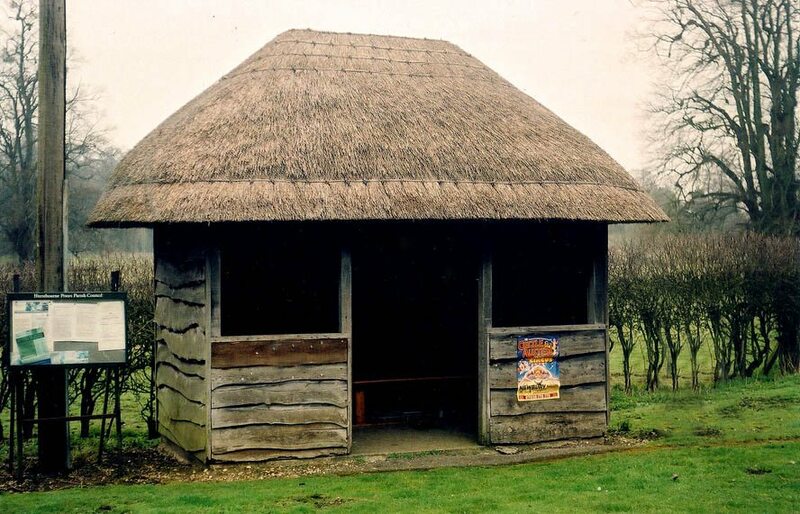 Having a hint of the Eastern tradition of thatching. Today’s thatch… On the Isle. Now the ornamentation is found only in the ridges, of some very attractive work, exclusively done in combed wheat and water reeds. Long straw having vanished. 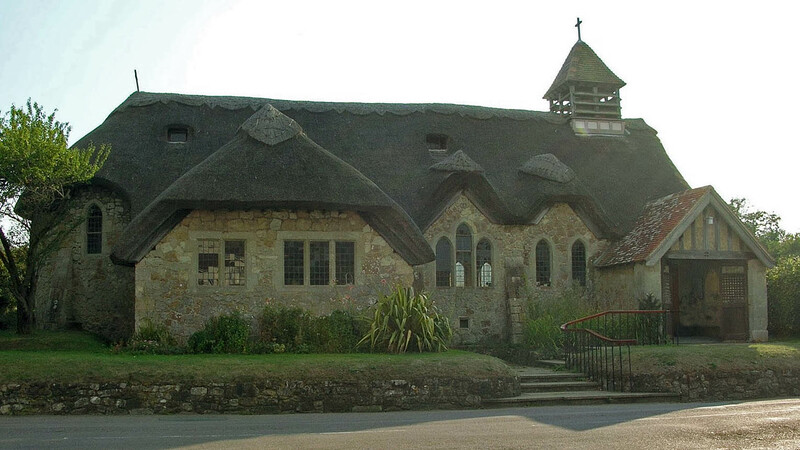 The lower images are of St Agnes’ Church, Freshwater. Built in the ‘Arts & Crafts’ style, 1908. 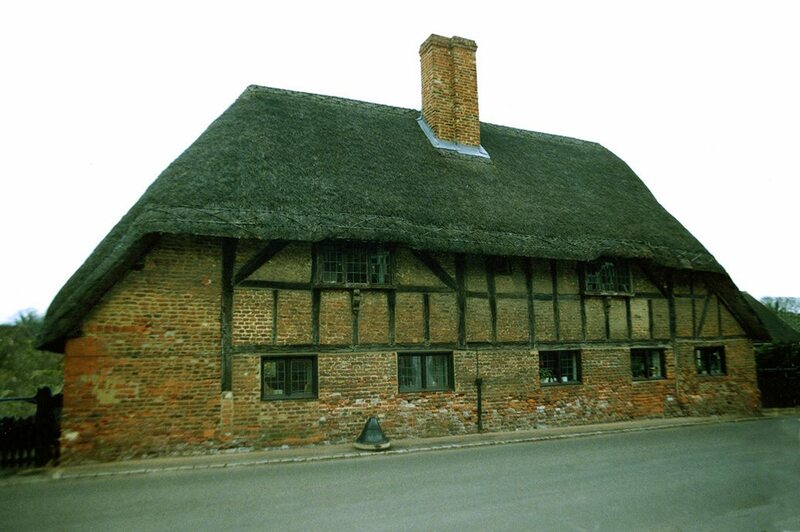 Being roofed with long straw thatching , for most of its life..
All historic images, of this craft, are rare. So the following, slightly grainy photographs are worth republishing. A century and more after they first appeared. They show the daily work of a thatcher, in the reign of Edward the Seventh. This thatcher’s name and exact location, have not come down the years. However, the photographer, a Mr W.T. Green, also took images of Selborne in Hampshire; seemingly at the same time. And our man could well have been based nearby. 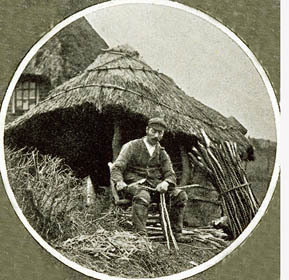 Family Man… Before any thatching, spars have to be made. Here our man poses with his family. A bundle of spar gadds on his shoulder. 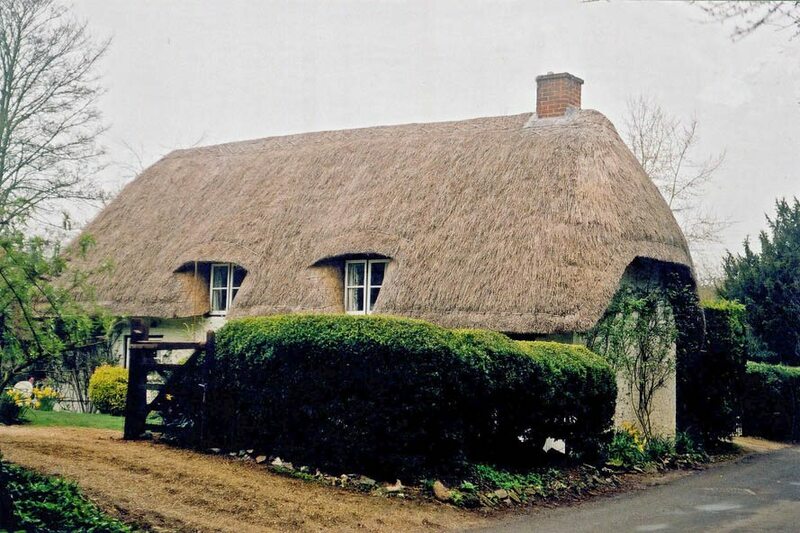 No doubt he kept his own cottage in order. As the repairs under the chimney show. Splitting and drawing… Obliviously the little shelter, behind the thatcher’s children, in the first image, was used when making spars. When enough have been made, work can begin… The right image, shows this thatcher ’drawing’ long straw, straight from a rick. Something many thatchers would never do… Preferring to create a bed of wetted straw, to yealm from. Our man probably also used his drawing method, when thatching ricks. A common enough practice, when doing this sort of work. But many purists would not be too happy, when a building needed covering. 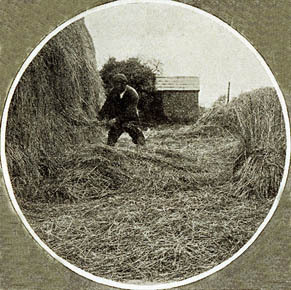 Trimmed and Finished… To those in the craft, the left image is a contradiction… As long straw, is being trimmed with a shear hook. A tool used with combed wheat reed. Associated more with the West Country, than eastern Hampshire. However our man has one… Perhaps he originally hailed from the South West. Which may explain his differing long straw, working methods. We’ll never know. Whatever his origins, he’s happy enough to pose, in front of his competed section of barn.